The fun part with these guys was going to be the bases. Many of the mini war gaming stores have materials required for the miniature bases, but I decided to just pick up a few things from the local model train store which has a wider range and would work just as well. 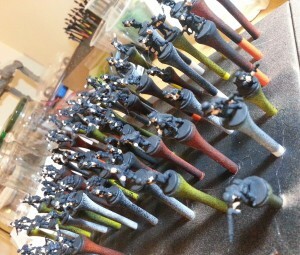 But before I could get into the bases, I first had to paint the miniatures, and there are sooooooo many to get through. Yet so many look so awesome at the same time. 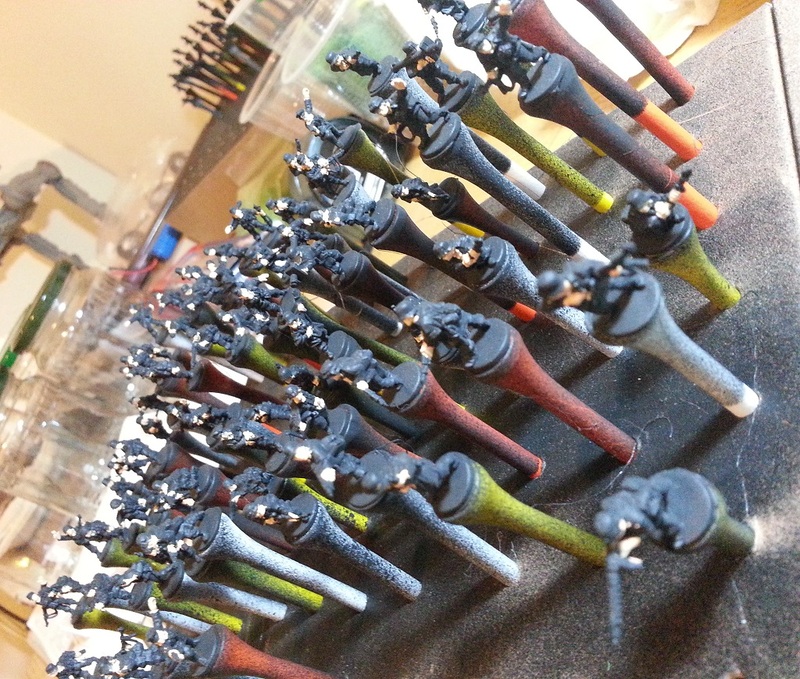 Question was, to tackle them all as a production line or do a couple bases worth at a time. Doing as many at once as possible would probably be more efficient in terms of time and paint, however doing small batches means I could get a few bases completed and see some progress sooner. 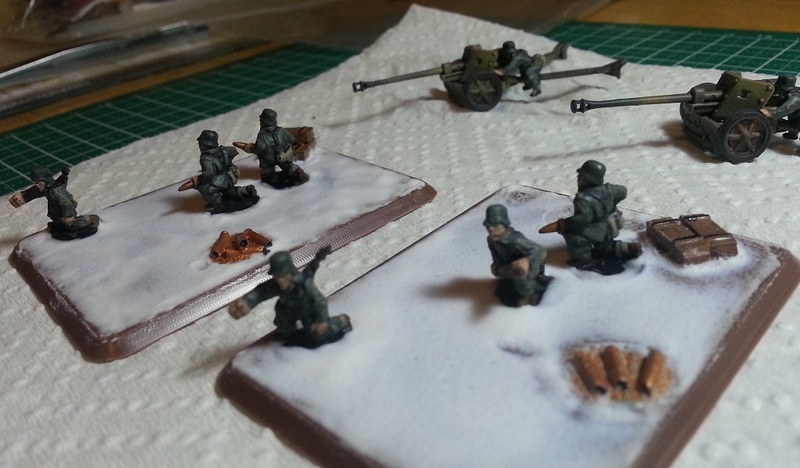 So I started with the Pak40’s. 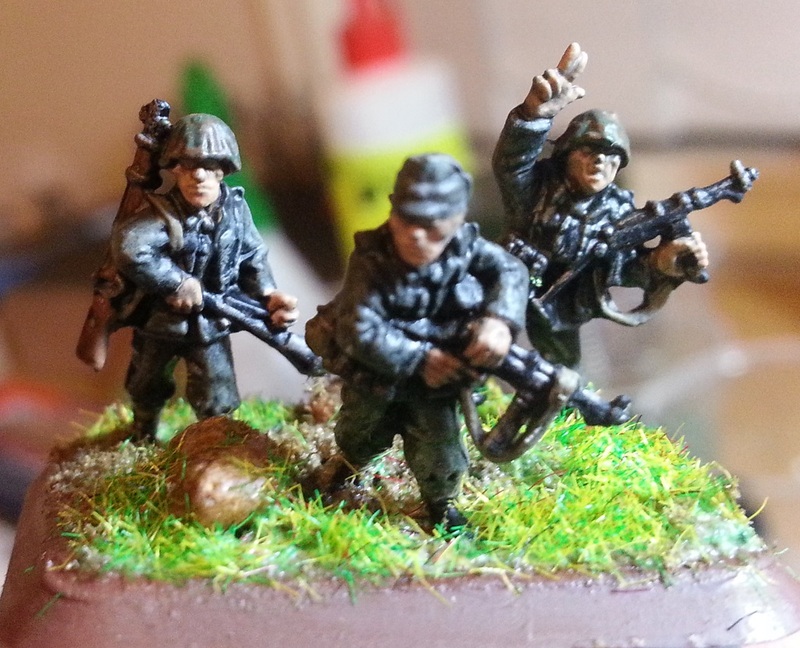 This was especially fun to build and paint as it’s quite a nice little diorama piece on it’s own. 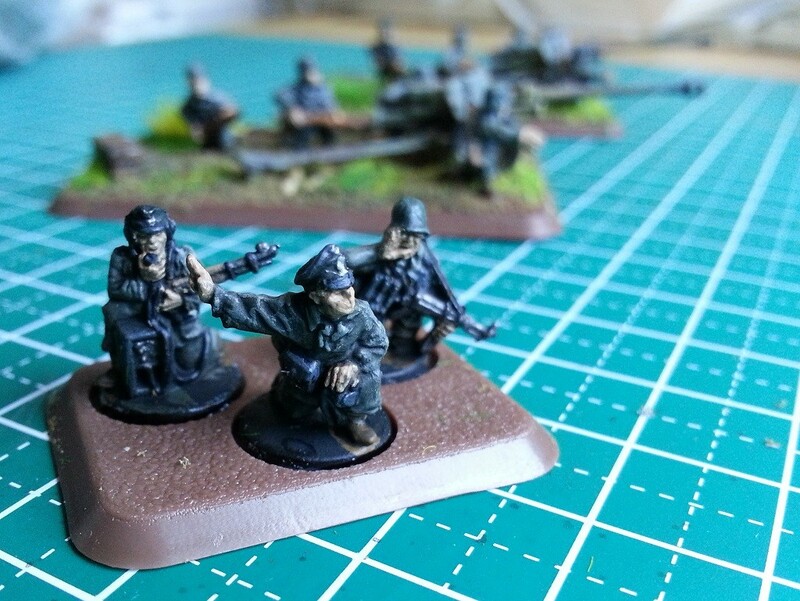 The Pak40, some dudes, shells, etc, with the figurines in some interesting action poses. The Pak40’s I had already sprayed at the same time I was painting the StuG G’s using similar colour scheme, and I painted the soldiers following the paint guidelines in the Open Fire Quick Start Guide, with only a handful of soldiers to fill these two bases, before long they were off their pegs and onto the base plates ready for some dirt, grass and rocks. This was all new to me, but from reading some material on making terrain for model railways years ago certainly helped. Once the miniatures are glued down in position, it’s just a matter of spreading on some PVA glue mixed with water (50/50) and throwing down whatever material you fancy. I started off with some flock/grass, then sprinkled some dirt looking material a couple rocks here and there and a grass tuft here and there to finish it off. 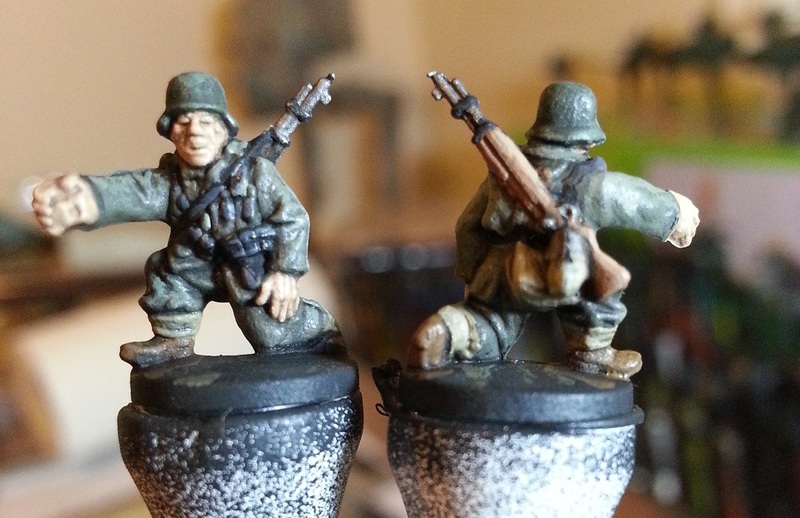 Followed by the Grenadierkompanie Company HQ section, Company Command and 2iC Panzerfaust SMG teams. 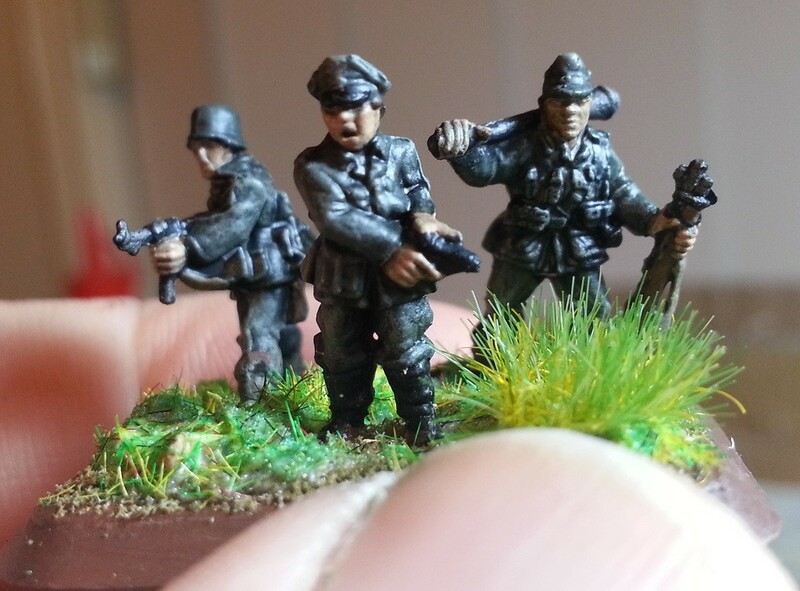 This entry was posted in Gaming, Miniature Wargaming and tagged flames of war, mini war gaming, miniatures. Bookmark the permalink.